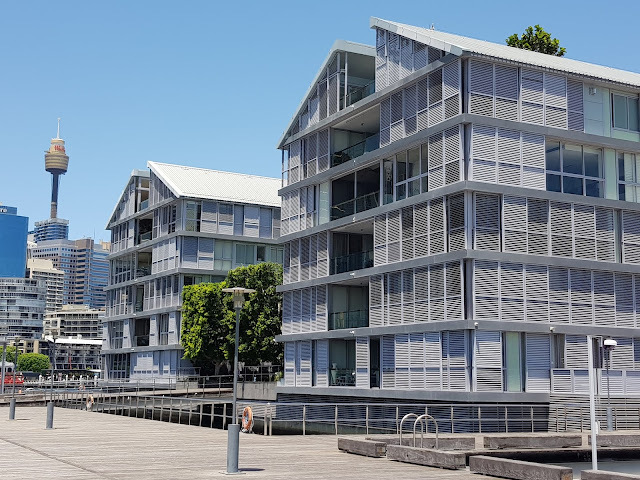 Sydney Wharf Apartments are in the redeveloped warehouse buildings on wharf 8 & 9 at Pyrmont Bay, in the inner city suburb of Pyrmont. 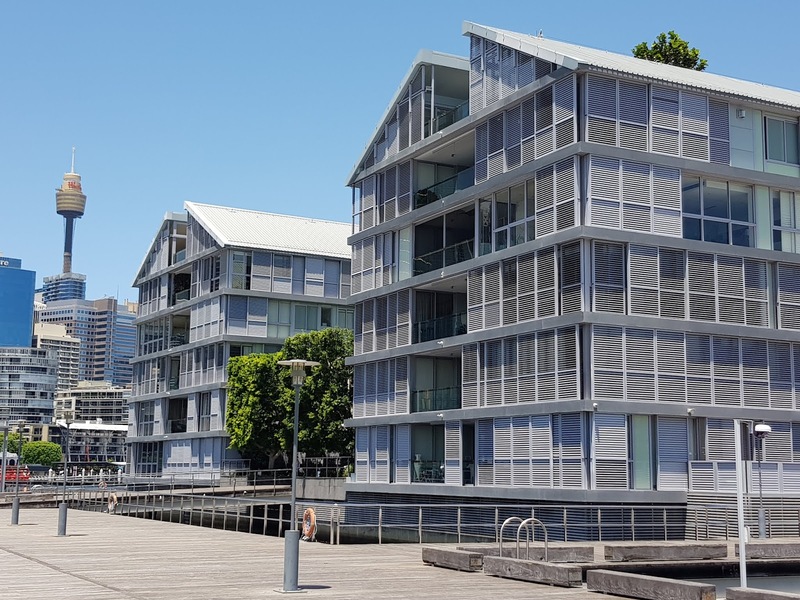 They were once part of Sydney's port facilities and have been converted to apartments, restaurants and a marina on the bay. Sydney Tower and office buildings are in the distance. Linked to: Our World Tuesday, Tuesday Treasures, Pictorial Tuesday, Travel Tuesday, Ruby Tuesday. So sunny....so well developed and attractive. That's right on the water, isn't it, I like the boards instead of cement in front. There's a marina down the street from me and I love it. Not crazy about the fishermen at night when you can't see them though. What is that tall tower in the background, I can see writing but can't tell what it is. Jeanna, it's Sydney Tower which has an observation deck and revolving restaurant. Westfield has naming rights because it sits above their shopping centre. Click on the link for a closer look. Such a nice modern design. Thanks for getting back to me, Jim, that makes this part of your world all the more interesting. Those are interesting walls. They look like screens. The apartments look nice, not the usual design for apartments. Cool looking tower. Appreciate you finding buildings with a specific history for All Seasons!